Written and Produced by Abimael Acosta, Directed and Edited by Alejandro Villalba, Associated Producers Jorge De Los Rios and Michael May, Executive Producer and Hosted by Omar Mora. Los Angeles, CA; November 9, 2014 – Moras Productions, Inc. Digital Division in collaboration with independent Puerto Rican Producers Abimael Acosta, Jorge De Los Rios and Michael May and Director Alejandro Villalba announced that “Indie Scene” will premiere his first episodes on the Indie Scene YouTube channel Tuesday, December 2nd, 2014. The guest for the first episode in Spanish will be actress Kate Del Castillo and the guest for the English version will be actor Demetrius Grosse. The show will feature 13 episodes in English and 13 episodes in Spanish for a total of 26 different episodes. New episodes will roll out weekly on Tuesday for 13 weeks. “Indie Scene” is a TV talk show program. The program is a Q & A style show with Host Omar Mora, interviewing some of the most successful independent filmmakers and their entertainers. The interview guests are directors, writers, producers, actors, casting directors, entertainers, amongst other artists. The interviews are held in a conversational and a casual style format, providing unique and personal anecdotes. The independent entertainers are from all over the world of different races and background, including Latinos, African-American, Caucasian, and Asians. The interviews cover their career paths, the work they have achieved and their continued career growth. The goal of the program is to create awareness of the great independent filmmakers to give them platform and voice to spread their positive messages and accolades within the filmmaking industry. “I am so excited to share this show around the world through the digital platform of You Tube. There are so many great independent filmmakers out there doing great projects that will inspire many people to follow their dreams. You will see all the struggle they had in order for them to achieve their passion in life, and I hope everyone that sees the show get inspire and follow their own dreams”, Mora said. The show was possible thank you to the contribution of Director and Editor Alejandro Villalba that at age 23, he wrote, co-directed and edited his first short film “Dios Solo Mira.” It was selected in both national and international film festivals, including in Cannes, San Francisco and Latin America. Producer Abimael Acosta has more than thirty credits as a writer, director and actor in multiple TV shows in Puerto Rico and Los Angeles. Acosta at this moment is working on his novel “Wizards”. “Wizards” is the first part of the saga of gypsy sorcerers. You can find his novel on Amazon.com. Producer Jorge De Los Rios is an actor that worked in projects for Nickelodeon and Telemundo. De Los Rios at this moment is located in Los Angeles, CA following his dream as an actor and producer. Producer Michael May is an award winning actor for his work on stage and screen, most recently for the film “First Night” where he was nominated at ITVFest as best actor for his performance. As a filmmaker, Michael is directing the upcoming feature “30 Days with My Brother”, and has directed numerous documentaries, commercials, and web series. Host and Executive Producer Omar Mora is the founder of Moras Productions, Inc. Moras Productions premiered their first project, a short film titled “A Busy Mind,” on PBS in Southern California back in May 2014. At this moment Mora is in post-production on his first feature film “30 Days with My Brother”. Mora also wrote “Ancient Explorers: The Lost City of Peru”, an adventure novel now available on Amazon.com. Moras Productions is an independent production company incorporated in Los Angeles, CA by the end of 2013. Moras Productions is currently in-development on four additional films. 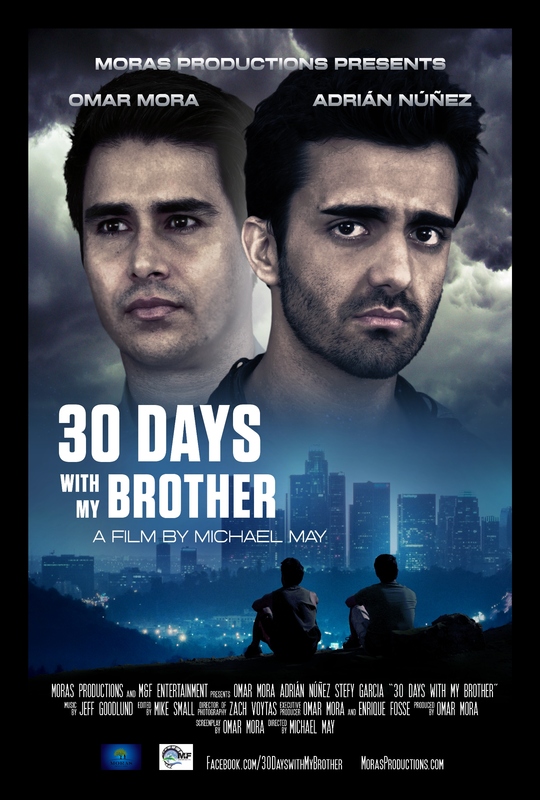 It’s in post-production on their first feature film “30 Days with My Brother” with expected release day on 2015. Their slate of projects range in genre, from family films to dramas to thrillers, horrors and sci-fi films. For more information visit their website at MorasProductions.com. Actress Amy Schloerb booked a supporting role in the upcoming feature film “30 Days with My Brother”. Born in Massachusetts, Amy Schloerb attended Hamilton College, where she double majored in Theatre and Sociology. After double majoring, Schloerb moved to Los Angeles and continued her training with prominent industry professionals including Myra Turley, G. Charles Wright, and the many talented improvisers of iO West. In 2011 she created SchloerBITS, an animated stand-up comedy web series. Schloerb was most recently seen on the CBS hit show “Criminal Minds”. She played a very emotional and dramatic character in a two-episode story arc this past season. Her past film and television credits include: 1600 Penn, Superbad, Like Mother, Like Death.